The Biblical Character Illustrated Curriculum is designed to help you teach character with a focus on God’s Word and applying His ways in everyday decisions. Each booklet defines the featured character quality of the month, examines related Scripture, offers practical application, presents a hymn and its history, and includes four-lessons each containing Bible story questions, a coloring page, a memory verse, and a related activity. Bring your teaching to life as you seek the Lord together with character lessons that are fun and memorable. Download free resources for the character quality of the month! These include a Bible story and coloring page, activity pages, memory verse page, and a hymn history with a musical recording for learning the related hymn. 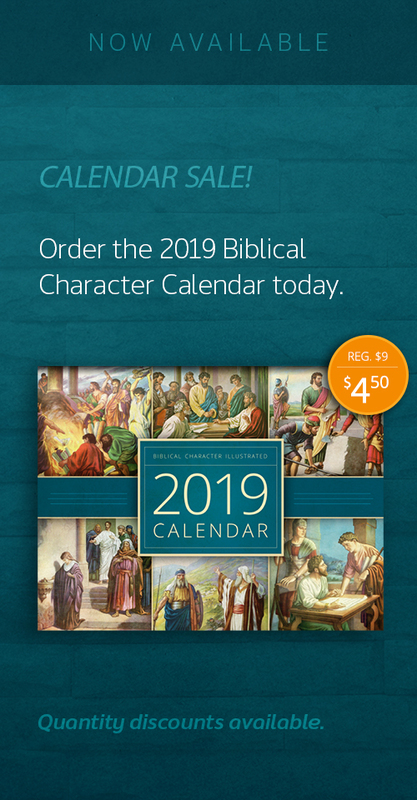 The 2019 Biblical Character Calendar follows the same schedule as the Biblical Character Illustrated daily emails and smartphone app. Start receiving the free Biblical Character Illustrated daily emails and begin each new day encouraged in the Word! The Biblical Character Illustrated App gives a daily Scripture reading and practical application for daily living. Download it to your Apple or Android device.